Stephen is a 21-year-old student who was badly injured in a forklift accident in July of 2012, the summer before his freshman year of college. 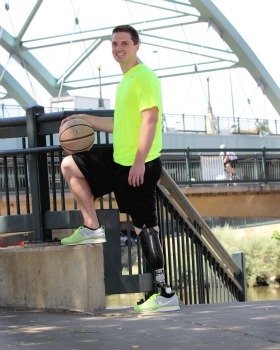 Once Stephen’s leg was stabilized, orthopedic surgeon Dr. David Hahn and plastic surgeon Dr. David Schnur of the Denver Clinic took him to surgery to apply an external fixator, a tool that helps regrow the 4 inches of tibia he lost in the accident. Dr. Matthew Terra, infectious disease specialist, also consulted on Stephen’s case, helping to eradicate an infection to save his leg. In October of 2013, Stephen’s frame was removed – his own biology had regrown over 4 inches of healthy bone. Though the outcome of Stephen’s bone transport was excellent, he had very limited motion and pain in his ankle. 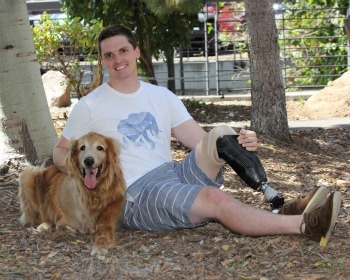 In November of 2014, Stephen made the brave decision to have his leg amputated below the knee so he could return to the active lifestyle he loved. Through this endeavor, Stephen continued to attend Calvin College in Michigan, where he is currently wrapping up his senior year with a 4.0 and his eye set on medical school! This is quite the accomplishment for any young adult, but when you take into consideration that Stephen had to travel back to Denver 1-2 times per month to have his fixator adjusted, it is truly inspirational. With the use of his prosthesis made by Chris Jones of Rebound Prosthetics, Stephen is able to once again enjoy an active lifestyle! Winston is a gentle 12-year-old Golden Retriever who was diagnosed with osteosarcoma in his front right leg in March of 2015. Winston immediately had an amputation to remove the cancerous bone and has adapted well to life with one less limb. This Colorado “transplant” (Winston is originally from Florida) absolutely loves the mountain air and the snow! He also enjoys hiking with his mom and playing with other doggie friends. Winston does not seem to notice he has three legs, nor do his doggie pals!